A policy brief by Nathan Barrett, Andrew McEachin, Jonathan N. Mills, and Jon Valant on differences in suspension rates and durations by race and family income in the state of Louisiana. Black students are about twice as likely as white students to be suspended, and low-income students are about 1.75 times as likely as non-low-income students to be suspended. Discipline disparities are large for both violent and nonviolent infractions. Disparities in suspension rates are evident within schools (black and low-income students are suspended at higher rates than their same-school peers) and across schools (black and low-income students disproportionately attend schools with high suspension rates). While across-district differences account for a small portion of the disparities, within-school and across-school differences each account for a sizable share of the disparities. Black and low-income students receive longer suspensions than their peers for the same types of infractions. For fights involving one white student and one black student, black students receive slightly longer suspensions than white students. The difference is about one additional suspension day for every 20 fights. This disparity is evident even after accounting for students’ prior discipline records, background characteristics, and school attended. Assessing the presence of direct discrimination by schools, which occurs when schools punish students of different backgrounds differently for the same behavior, is a fundamental challenge for research on student discipline and requires many assumptions. Researchers typically cannot observe students’ true behaviors—only the records that result when schools write up students for an infraction. We examine the punishments that occur after interracial fights, which we believe provides a credible check for the existence of direct discrimination in cases where students behave similarly. Given that we find that direct discrimination occurs in this context, with a black and white student receiving different punishments for the same exact incident, it seems likely that direct discrimination would occur where discipline disparities are less visible. 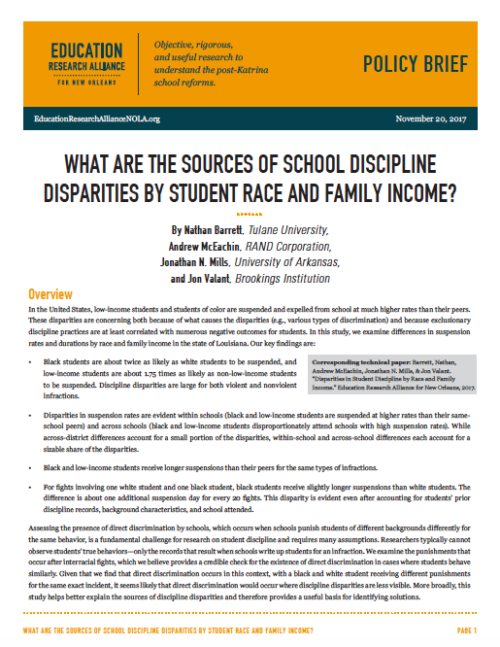 More broadly, this study helps better explain the sources of discipline disparities and therefore provides a useful basis for identifying solutions.